Germany's Tony Martin is taken to an ambulance at the finish line after crashing in the first stage of the 2013 Tour de France. (AFP PHOTO / DANIEL SANNUM LAUTEN --NORWAY OUT). 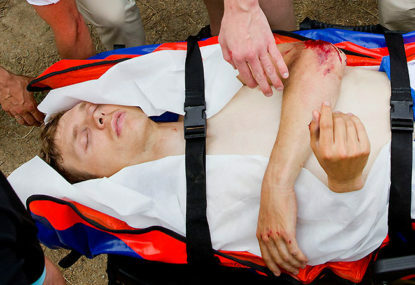 Falling unconscious after a Stage 1 crash, stretchered to hospital, and suffering a contusion (bruising) of the lung, Tony Martin should not have continued racing the next day at the Tour de France. Such is the mythology of cycling that serious injuries are routinely brushed aside by the rider involved, in the interests of team goals and romantic notions that this is a sport for the hardest of the hard. In what other sport do participants continue on with fractured bones, serious sprains, or having scourged off half their skin on hot tarmac? Cycling is, and always has been, a sport of suffering and perseverance; an effort to best the obstacles presented by our fragile bodies. So the mythology goes: the mind, the will, can and must overcome all, in the pursuit of glory or glorious defeat. When the body resists, the will must be unbending. Anyone who has trained for anything physical knows the good pain, that transcendent state where you’re pushing past your mental limits, and cyclists thrive on it. Cyclists will not easily say no. In this masochistic context, it’s not surprising Tony Martin was back on his bike in Stage 2, having limped across the finish line after falling heavily a few kilometres from the finish line in the chaotic closing stages of Stage 1. But reports that Martin blacked out on the team bus after his crash should have rung alarm bells. That’s a clear cut sign that Martin suffered a serious concussion, or to use the more widely accepted medical term, a Mild Traumatic Brain Injury (MTBI). The short term effects of concussion include headaches, dizziness, blurred vision, memory loss, confusion, and inability to concentrate. These symptoms can last for several days. Is it really safe for a rider with a brain injury to continue on in a race as physically and mentally demanding as the Tour de France? If Martin is not at his sharpest he’s a liability to himself and the rest of the peloton. It only takes a momentary lapse in concentration to clip a wheel or miss your line into a high-speed corner and crash again. That would be really dangerous: the risk of longer-term damage to the brain is significantly higher for repeated concussions. It’s a condition known as second-impact syndrome, which causes rapid swelling to the brain and raises the risk of chronic brain damage. This is why footballers are often forced to miss several matches after suffering a knock to the head – another impact could cause serious long-term harm. There’s plenty of medical research on the medium and long-term effects of these types of brain injuries, and it isn’t pretty. Long-term studies of NFL players show that they are three or four times as likely to suffer from neurodegenerative diseases like Parkinson’s or Alzheimer’s as the general population. So head injuries are serious, and if you suffer one you really should make sure the symptoms have passed before you resume the activity that gave you one. That Tony Martin was back on his bike the day after a concussion severe enough for him to lose consciousness seems crazy to me. Even in a sport that prides itself on being the toughest, it seems a step too far. When you’re talking about a significant risk of long term brain damage, it seems to me that the team medical staff owe it to the rider to tell him to stop. The days of riders risking their long-term health on the advice of team doctors should have ended. There was a time when riders couldn’t say no to the directors and doctors who cared more about winning and sponsors than the riders under their care. Those days resulted in EPO, blood doping, and criminal charges against the likes of Eufemiano Fuentes. This is a different matter entirely, but the fact remains that Martin’s team should have been more cautious, and more willing to protect the rider’s health at the expense of his and the team’s ambitions. The fight against doping is synonymous with the fight to protect riders’ health. Martin himself probably wanted to keep racing. He is a star rider, and would not want to let his team down, especially before the stage four team time trial. Pain can be denied. It’s also understandable that Omega Pharma – Quick-Step would want to keep a rider of Martin’s power and ability in the race. What should also be understandable is that some things are more important even than the Tour de France.